Overview: Llandaff Lodge is situated close to Llandaff Oratory (The Little Church) on the edge of the escarpment with a view of Spionkop in the valley. It is a large 4 bedroom, three bathroom house with massive fireplace, swimming pool and entertainment area. Half way between JHB and Durban its perfect for Weddings, Birthday parties or just an overnight stop. Breakfast is served, in bed at the tea garden or you can go self-catering. We only take one booking at a time so you have complete privacy. 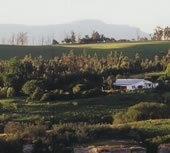 A romantic getaway in the misty mountains, central to the battlefields and the berg.